I'd say have a little faith and you'll see. If I could write a letter to me." I might add, I would add something to the effect that "Hey YOU! You'll find a guy who tolerates your propensity for getting side-tracked." Quite frequently, and sometimes I have to admit...conveniently. The Better Half and I ventured to the cute little town of Stockton, New Jersey on Sunday. The temps were in the upper 90's at home. And for the record, it wasn't any cooler in Jersey! But we DID find a great little wine store. And we DID find quite a bit to purchase. Letter to my seventeen year old self: you WILL like wine. On the way back to the car we traipsed. Wine all packaged in a big box for us. The Better Half doing his best impersonation of a pack mule. Sweat dripping. The perfect time to get side tracked by a mailbox. Because who wants to be a pack mule when you can be a photographer?!? Letter to my seventeen year old self: You should remember to thank your Better Half for putting up with you! Links from blogs, Instagram, Flickr are all accepted as long as your post is in the spirit of Song-ography. Thank you to all who stop by, leave a comment, post a link, and take some time to visit some of your fellow Song-ographers. Can't wait to pop on over to your links myself! Love that wine store...and the gas prices. Cool mailbox, and what a concept... not even sure where to begin in my letter! Who knew there was a Stockton NJ! I know all about Stockton College, go figure there not in the same town! I, too, have a patient Better Half to tolerates my frequent photography stops! Pretty mailbox with wildflowers. I think men with the surname Blackburn have a secret middle name called Patience. You're not going to believe it, but Mike has mentioned feeling like a pack mule, maybe the only difference is he will really start braying until someone takes something away from him to lighten the load. It can be funny but also embarrassing...................... He actually does a realistic mule impression. Enjoy your day. I like that Brad Paisley song. The mailbox was a pretty find. Shopping for wine is one of my favorite things to do! I hope it cools off, have a happy day! Oh, so much I would tell myself in a time letter. Easy to see why you got sidetracked and as a designated pack mule, can appreciate your better half's disposition at the end of the journey. As for the photography tolerance, those of us who are lucky, have a better half who knows when to hold 'em and when to fold 'em when it comes to photographic pauses along the journey. I'm just not sure if it is from me wearing my bunch down, or they have truly come to appreciate my photography. Either way, it works. Cute mailbox! I also have a husband who puts up with me and my camera. He'll be walking along thinking I am beside him when actually I am lagging behind as something has caught my eye. Letter to me - wow that would a rather long chronicle. How could you NOT get sidetracked? 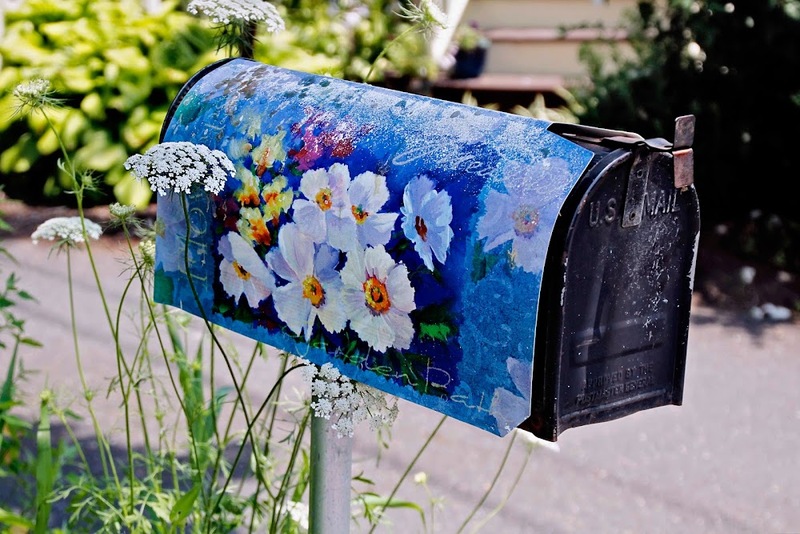 I love that mailbox and the way it blends with the real flowers growing next to it. Great find and great shot! Conveniently forgotten about the time I was seventeen! Yes - I remember NOT liking wine!!! Good that that has changed over the years....and that I found a husband who knows about wine and is willing to carry it! Sounds like a great outing! Of course you stopped to photograph this amazing mailbox! How could you just keep going? My husband and yours should meet -- they share traits of patience and thoughtfulness. Recently my hubby spent so much time helping me set up for fireworks in the desert, 110 degrees in the dark, getting my tripod just right for me. They are gems, these guys! Great letter to yourself :) What a mailbox. You know, when I moved to the US I was so fascinated by the mailboxes here that I thought about doing a whole photo series of them. Alas, I never did.